From the first chapter of Amos through the sixth chapter, the relationship between God and Amos, and Amos and the people he was sent to, was a simple line of communication. God spoke to Amos, Amos in turn, repeated what God said to the Northern Kingdom Israel. In Amos chapter seven we find a significant change in the way God related to His prophet. Because of God’s new treatment, the whole communication line was affected. Amos reacts to God’s new thing by relating differently to God, resulting in a change in the way the prophet was perceived by the people. Since chapter one Amos has been declaring, “Thus says the LORD”. As a matter of fact, every one of the six previous chapters includes exactly the phrase, “Thus says the LORD”, or some version of it. Now in chapter seven God shows Amos some things. Last time we talked about the first two things God showed Amos. We said Yahweh demonstrated in a vision two different punitive actions He was about to take against Israel. Moved by compassion, Amos steps in and stands in the Gap for the nation Israel as intercessor. God responds to Amos’ plea and withdraws His hand of judgement against Israel. Twice God shows Amos what He is about to do against Israel, twice Amos intercedes, and twice God relents. In verses seven through nine God shows Amos another vision. This third vision differs from the previous two in some significant ways, which we will explore. And the sanctuaries of Israel shall be laid waste. In the first vision, Amos sees a destructive swarm of locusts. In the second vision, Amos sees a destructive torrent of fire. The first difference between this vision and the previous two is Amos sees the Lord Himself. Another striking difference between this vision and the previous ones is Amos has no opportunity to stand in the gap for Israel. This time Yahweh is showing Amos an immutable event. Here we see the Lord standing on a wall constructed using a plumb line, with a plumb line in His hand. What must this have been like for Amos? “Wow! I’m seeing a vision of the Lord”! I don’t know about Amos, and I don’t know about you, but I’d be totally freaked out! And I can guarantee the vision would have my undivided, full attention. The Lord is showing me a vision of Himself! Amos is careful with the details. “The Lord stood on a wall made with a plumb line”. This wall was constructed to be perfectly vertical. It was constructed using a plumb line. But now the Lord is standing on top of this wall. He has His plumb line in His hand. How does this wall stand up compared to Yahweh’s own standard? Straight by man’s standard may not line up under God’s standard of measurement. What about the boundaries in your own life? Who’s plumb line did you use when you constructed your wall, yours or God’s? Does your wall lean? Have you set boundaries for yourself but then bend them when it seems convenient to you? 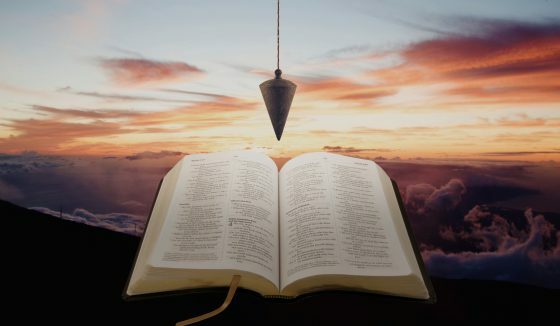 Would you want God standing on top of your wall with His plumb line? God tells Amos I’m setting my plumb line, my standard right in the midst (middle) of my people. I will not pass by them, or delay their judgement anymore. Now is their time of accountability. I’ve often heard it said when God judges a nation He begins with the house of God, or more specifically in our case, the church. Maybe that idea comes from verse nine. One may say, “I don’t understand. Why would God destroy the high places of Isaac and sanctuaries? It makes much more sense when you realize the people of Israel had perverted the high place of Isaac and the sanctuaries. Instead of worshipping Yahweh, the covenant God of Israel, they were worshipping the false pagan gods. They made idols and put them on the altars. This was what their worship had become. We will leave the last part of verse nine, “I will rise with the sword against the house of Jeroboam”, for next time when we explore the subsequent verses. Have we been hearing God’s message, His messengers? If Jesus were to put a plumb line in the midst of our churches and private lives what would He find? If He were to walk into one of our church services what would He find? Would Jesus encounter a people in love with Him, striving to walk worthy of their calling, focused on glorifying Him in both word and deed? What would He find at the altar or pulpit? Would the man in the pulpit be repeating, explaining, and declaring the words of Yahweh as found in His Holy book? Or would he instead be engaged in modern-day idolatry, extolling the virtues of some culturally relevant, feel-good message designed to speak to our wants? It is my prayer we will learn from the book of Amos and not repeat the mistakes of the Nation of Israel. I praise God regularly for our Pastors and church family who make the accurate preaching and teaching of the Bible top priority no matter the cost. They understand that the truth found in the Holy Bible is always relevant in any age among any culture. They dare not read modern culture back into the Bible and preach some twisted, warm fuzzy message, specifically tailored to not offending all who would hear it. God is a good God! God is truly worthy of all praise and worship! 1 Reply to "Amos - Chapter 7 - Plumb Line"